A new phone system run by a private company will replace personal mobile phones in immigration detention centres, Corporate Watch can reveal. The trial at Tinsley House detention centre, near Gatwick airport, is run by Global Comms and Consulting Ltd (GCC), which specialises in secure telecommunications services to major government agencies and multinational companies. As a result, detainees will not be able to call free numbers and will pay significantly higher rates to call their family and solicitors. All calls will also be recorded, monitored and disrupted when necessary by the immigration authorities and/or the immigration prison's management. Immigration detainees will have their private mobile phones confiscated on arrival and given special 'detention phones' that are connected to a central system and do not accept other SIM cards. A three-month pilot scheme has been in operation for new detainees at Tinsley since the end of February. 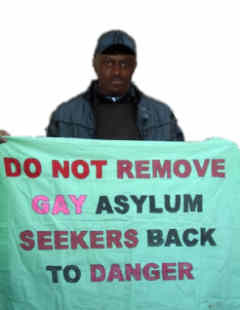 If 'successful', it is expected to be rolled out to all other detention centres in the UK. No information about the scheme has been released to the public. A spokesperson for the UK Border Agency (UKBA) confirmed the existence of the trial but could not give more details as the scheme is “run by G4S,” the private security company that manages Tinsley and two other detention centres in the UK. A spokesperson for GCC confirmed that the company has an agreement with G4S to operate the new system but declined to discuss any further details due to “the sensitivity of the issue.” GCC, based in Stamford in Lincolnshire, operates a similar system in some UK prisons, while BT provides for the rest. A number of new detainees at Tinsley House, who are forced to use the new system, told Corporate Watch that the new phones are “crap” and “don't work.” Detainees' most common experience appears to be that the phone is either “always engaged” or gets cut off “after a few seconds.” Both GCC and the UKBA said some “initial technical faults” have now been fixed, while G4S insisted that “there haven't been any problems.” It is understood that no formal or independent evaluation of the new system is planned, only “an internal one” by G4S. According to sources in the UKBA, the main reason for introducing the scheme, which is similar to Inmate Telephone Systems used in prisons, is to “have more control over detainees' phone calls.” This allows the immigration authorities to eavesdrop on all calls made and received by detainees in order to anticipate any possible 'problems.' It also gives the authorities the ability to switch off the entire phone system in a particular detention centre in case of a disturbance or riot inside, so as to prevent detainees from contacting supporters, the media and so on. Eye-witness accounts reported by detainees to the press and detainee solidarity groups on the phone during major protests in detention have caused the Home Office much embarrassment in the past. For instance, reports of violent assaults by Serco security guards on hunger-striking women in Yarl's Wood detention centre in February 2010 led to a lot of bad publicity (for the UKBA and Serco) and calls for an independent enquiry into how the protest was handled.